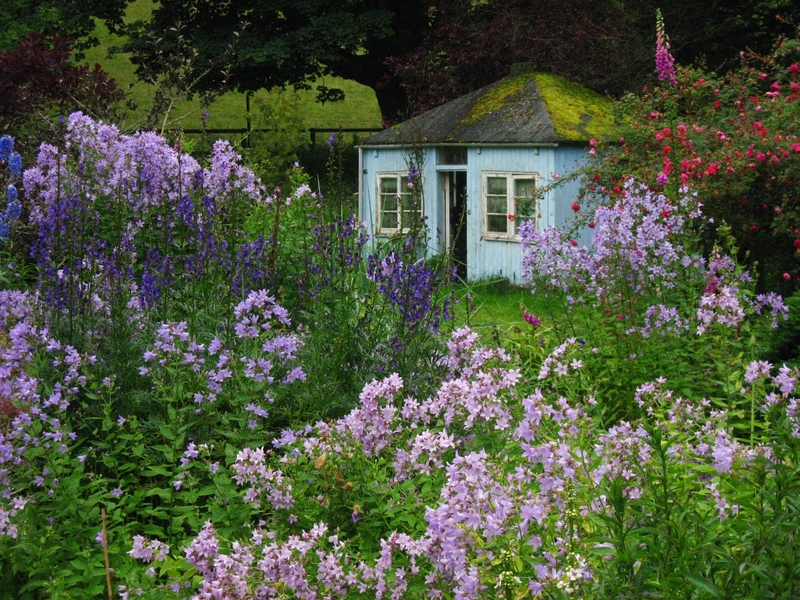 A real country house garden with sweeping, colour themed herbaceous borders set around large lawns. 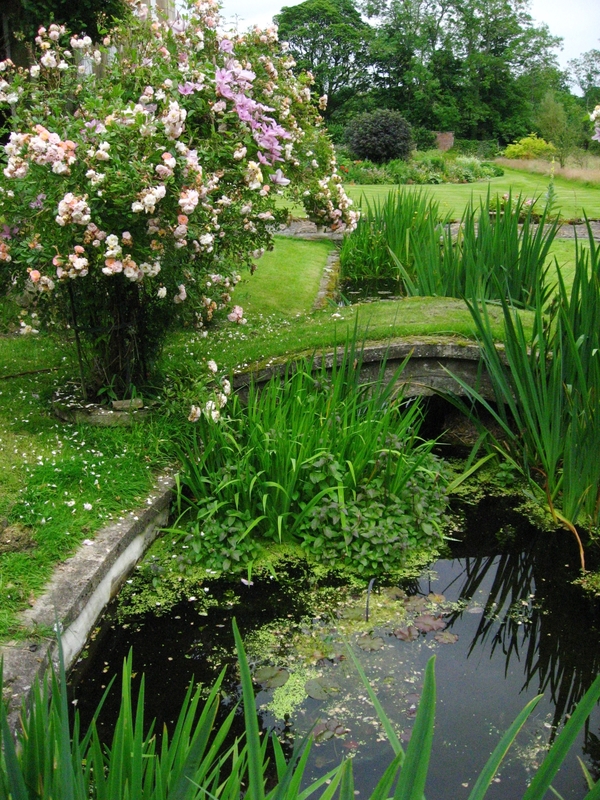 Unique Lutyens inspired rill with grass topped bridges and climbing rose arches. Part walled kitchen garden and paved courtyard. Bog garden with pond. Developing new border and rose bed. Wild flower meadow with specimen trees. Woodland quarry garden with rhododendrons, azaleas, hostas and rare trees. Reached up a long curving drive on a hillside in the county town of Hexham, at Loughbrow you feel you are in deep countryside. Far-reaching views are seen through the mature woodland that shelters Loughbrow House; an enormous Rosa filipes 'Kiftsgate' climbs to the top of a tall Wellingtonia tree. Japanese wineberry arches over a door in a high wall that leads into the garden - lawns span out, edged by sweeping, colour themed herbaceous borders. 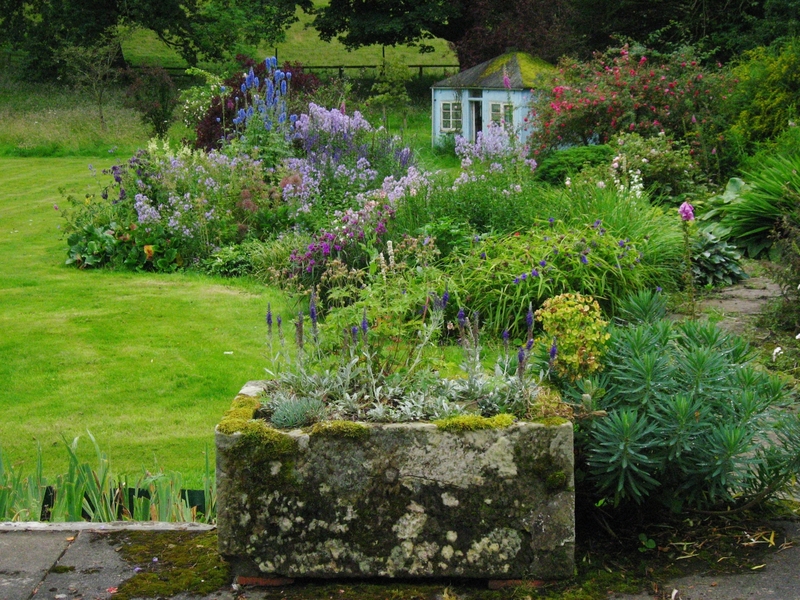 To the left is a softly coloured border of yellow, grey and white, with roses and clematis reaching right up against the wall; tree peonies, onordornum thistles, slender spires of yellow foxgloves and Sisyrinchium striatum mingle with flat topped golden Yarrow, apricot Peruvian lilies, and Geranium 'Kashmir white'. Two other large borders curve around the lawns, leading the eye to a billowing wildflower meadow and a distant bog garden, colourful with candelabra primulas. As we had bad rose sickness in the border on the edge of the terrace, this has been removed and the border made half as wide filled with lavender and edged by low growing pink geraniums. The statue at the beginning of the mown path is being move to the lawn surrounds by four box edged beds to be filled with new roses at a later date Specimen trees grow in the meadow and there is a curving pond with bog loving plants around its margins. A Yew hedge separates the flower garden from a productive vegetable garden. Home-made jams and chutneys for sale.